There is (what can only be described as) a software bug in the Thrust Reference setting software in the 777. While this bug manifests itself in several situation on normal and non-normal operations, it manifests significantly with flight safety implications during VNAV engine out approaches. I discovered this issue back in the late 90’s when I was working in the Sim. I kept noticing it and writing it up for the Sim Engineers to fix. They would report back that they’d fixed it (or couldn’t understand what was wrong); another instructor would review the fix and miss-understand what the original report was about, and clear the fault. Then later I’d see it again, and report it – and round and round we went. Eventually the Sim Engineers hunted me down and got me to show them exactly what the problem was – which I did. We all referred to the FCOM, agreed that it was not working, but then one of the S/Eng asked me “What does the Aircraft do?”. Hum. I said – so I went and checked. Lo and Behold – the Sim wasn’t the problem, the aircraft was. Oops. I brought this to the attention of several levels of Training/Technical management, without much interest, so I circulated an e-mail amongst instructors and ensure my students were aware of it. Boeing’s airplane design is such that GA (Go Around) is set as the thrust limit (displayed above the N1 indication) any time the flaps are extended (FCOM 04.20.16 refers) or the glide slope is captured. One assumes that Boeing’s intent was that GA should remain the thrust limit to either Landing or the Go-Around in order to provide maximum available thrust for manoeuvring while configured for landing. However when VNAV is engaged after flaps have been extended, the Thrust Limit is reset to CRZ. Irrespective of the demands of the situation (Weight, Density Altitude, Configuration, Selected Airspeed, etc) – by design the auto throttle cannot command more than this selected Thrust Limit – CRZ. In most normal ops situations this reduced thrust limit is adequate to preserve airspeed irrespective of configuration (Engine Out, Gear, Flap) – particularly in the 777-300ER. 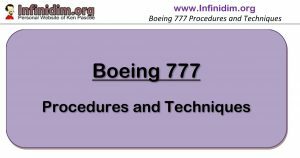 But 777’s with less thrust such as the -300/-200, or in performance limiting situations such as weight in excess of MALW, high density altitudes, etc – insufficient thrust can exist to maintain airspeed/altitude. Simply pushing the thrust levers forward (a disconnect for Manual Thrust is probably the better suggestion). * While CON thrust should be enough to maintain speed at maximum landing weight, higher weights may require even more thrust. Assume a 777 at maximum landing weight, approaching the final approach fix (FAF) at platform altitude for an Engine Out NPA. The crew intend to use VNAV for the approach, but have manoeuvred to the initial approach altitude using Basic Modes (FLCH / VS). Configured correctly at Flap 5/Flap 5 Speed, thrust reference will most likely be GA, set automatically when the Flaps were extended. At 3 nm from the FAF, Gear Down/Flaps 20/Flap 20 speed is selected. Thrust levers retard to slow the aircraft to Flaps 20 speed. Meanwhile the PF will set the minima in the altitude select window on the MCP, check track, engage VNAV PATH and speed intervene. However with the selection of VNAV, CRZ thrust reference is set – unnoticed by the crew. As the aircraft approaches Flap 20 speed, thrust levers advance in anticipation to achieve speed stability (giving the PF the tactile feedback expected of thrust maintaining speed), but thrust is now limited by CRZ thrust. On a Bad Day, Engine Out with the combination of near maximum landing weight and/or high density altitude, CRZ thrust is insufficient to maintain speed, but often enough to preclude a negative speed trend indication. Speed will now continue to reduce until (a) descent for the approach commences, (b) an increase thrust limit is set; or (c) stick shaker/stall protection. Speed Protection? At minimum manoeuvring speed, low speed protection would normally kick in (minimum AFDS speed or eventually auto throttle wakeup), but in this case this protective feature is limited by the CRZ thrust limit setting. The only low speed protection (through the autopilot) that will function is stall protection – as the aircraft approaches stick shaker speed, it will pitch forward and descend with failed FMA AFDS mode indications. Prior to a low speed excursion and stick shaker activation, the problem can be corrected by selecting GA through the FMC Thrust Lim page or pressing the CLB/CON switch (CON thrust limit only will be selected) – or simply pushing the thrust levers forward – whether disconnecting the A/THR first or not. CON thrust should be enough to maintain speed at maximum landing weight. Higher weights may require more thrust. On all approaches (after flap selection), FLCH may set CLB/CON, but glide slope intercept will reset to TO/GA. TO/GA switch FMA mode activation sets GA thrust, so GA thrust limit is set during all go-arounds. Flap extension beyond 22.5° sets GA thrust limit. This anomaly does not impact on other NNM procedures (such as Windshear and GPWS). These recalls require either TO/GA Switch activation and/or manual thrust.